First Line: Saturday, August 6, 11:21 p.m. She needed to get to the road. 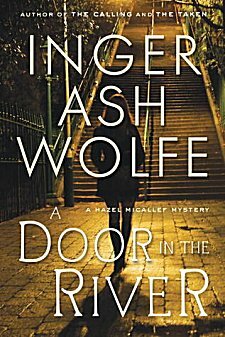 Inspector Hazel Micallef is the type of character I love, and my love affair with her began with the first book, The Calling. In that book, she is the 62-year-old interim police chief of a small town force in the province of Ontario, Canada. She's divorced, not particularly likeable, and is racked with pain. She lives with her octogenarian larger-than-life mother who's an ex-mayor of the town in which they live. Hazel is smart, relies a lot on her intuition, and doesn't know the meaning of the word quit. In this third book, Hazel's story continues. One of the most popular and well-known men in the community has been found dead in the parking lot of a smoke shop on a nearby reservation. The autopsy shows that the man died of anaphylactic shock after being stung by a wasp. Hazel does not believe the findings. She knows the man, and after talking with others who were even closer to him, too many things just don't add up. Then in short order, the dead man's wife is attacked, and another man is killed. Both crimes have a common denominator: a lone woman who seems to be desperately searching for something. Who is she? What is she looking for? Is she also responsible for the first man's death? Is Hazel going to be able to solve these crimes before someone else dies? It's a good thing that Hazel is a strong woman because there's a lot more on her plate than a few violent crimes. She's just been informed that there are changes afoot in the police department, one of them being that she has a new boss-- a man whom she used to supervise just a short while ago. But even more worrying than the crimes and the new boss is the fact that Hazel's 88-year-old mother, who's always been so vibrant and full of vinegar, seems to be giving up. As a daughter who loves her mother dearly, this is the hardest thing for her to face. Give Hazel a bad guy any day over seeing her mother lying in bed with her face to the wall. One of the things I love most about this series is the author's skill in changing my perspective. At the beginning, the killer is a person to be feared and reviled, but as the story unfolds, we find we need to change our point of view. This is about much more than a woman on the rampage, and as Hazel puts the clues together, she understands this and knows that she will not rest until everyone responsible is brought to justice. Larysa is one of the best "villains" I've read in years. As more and more is learned about this woman, my perspective continually shifted from fear and abhorrence to understanding to great unease. She is a character to remember. As is Hazel. In her many years of policing, she's excellent at her job, although her people skills are sadly lacking. If she cares about someone and that person is in danger, she will literally move heaven and earth to save them, regardless of the cost to herself. I've just learned that there are three more books planned in this series, and I couldn't be happier. With superbly plotted stories and a strong-willed quirky main character, this is one series that I want to hang onto for dear life. Is this one of the formulas for books that you love? Then I highly recommend that you get your hands on all three of these books. Is it necessary to read them all in order for them to make sense? Not all all. But when a character like Hazel is involved, you don't want to miss a word of her story! I'm just loving this series too! Will hate to see it end. I know they all must end at some point, but there are series I wish could go on into infinity. This is one of them. Cathy - So glad to hear this one lived up to the promise of the first too! Must add it to my "will read very soon" list. There are indeed some characters and series that you hope keep going on and on and I'm always delighted to hear when there are more books planned in my favourite series.